[www.inewsguyana.com] – Chris Gayle has said that he will “skip” joining up with Dolphins for South Africa’s domestic Ram Slam T20 Challenge, as he is still recovering from injury. 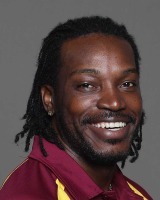 Gayle announced in a television interview during the Big Bash League match between Sydney Thunder and Brisbane Heat that he would not be travelling to Durban. Instead, he will be focusing on making a return for West Indies’ regional 50-over competition, which begins at the end of January. This will be the second time Gayle has withdrawn from Dolphins, after a similar situation two seasons ago. Gayle originally signed with Dolphins for the 2011-12 tournaments, but did not play a game. On that occasion, he arrived in South Africa carrying an injury, received treatment in Durban and then left when it became apparent that he would not recover in time. With Shahid Afridi already pulling out from joining Knights due to family reasons, Gayle’s no-show is a double blow for the competition which was aiming for a much larger foreign presence. Meanwhile, Gayle is one of three players that have been retained by his Indian premier league side, the Royal Challengers Bangalore. They have retained Virat Kohli, Chris Gayle and Ab De Villiers ahead of the 2014 IPL auction. The franchise has also announced the appointment of Daniel Vettori, who played for royal challengers in previous seasons, as head coach and Allan Donald as bowling coach. Trent Woodhill, who is currently David Warner’s personal batting coach, was named the franchise’s batting and fielding coach for the season. January 10 is the deadline for the IPL franchises to announce their list of retained players, ahead of the auction on February 12.